Cycling campaigners want a bicycle database rolled out nationally to aid gardai in returning recovered stolen bikes to owners. A localised bicycle registration scheme at the Bridewell garda station in central Dublin was extended in recent weeks to Donnybrook station, but while campaigners call the schemes “commendable” they are eager to see it expanded. He said the gardai or a state body such as the National Transport Authority should role out a centralised database of bicycle. Returning recovered bikes to owners is seen by the gardai as a “huge problem”. 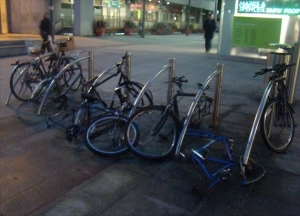 A chief superintendent in north Dublin last year said that while 35% of stolen bicycles are recover only between 5% to 10% are reunited with their owners. Bicycle theft has increased to the extent that some garda stations have problems storing the hundreds of bicycles recovered each year — bikes which cannot be retuned to their owners are auctioned off with the proceeds going to the state. The scheme at the Bridewell and Donnybrook records the serial number, make, model, and other identifying features of a bike, as well as the owner’s contact details. The garda press office refused to comment on when or if the registration process will be rolled out to other stations. “We would urge people with bikes to keep a note of their serial number along with a photograph of their bike and any identifying marks on it on file in case of theft. This will assist An Garda Síochána in any investigation,” said a spokesman from the garda press office. Andrews said a lot of bicycle theft is “opportunistic” and bicycle theft could be reduced “quite considerably” if cyclists spent at least 10% of the value of their bikes on a decent lock or “ideally two locks”. He pointed out that it was common mistake to only lock a bicycle wheel or frame when both need to be locked to a solid object. We have been runing an in house registration for more than a year, we’ve approached the garda about this issue but have had no reply. It is our understanding that a garda took it upon himself to develope this registry fair play to him whom ever he is at least thats the ball rolling. We try to register every bike that passes the depot. When bikes are stolen its great to have someone to contact for the information the garda will certainly need. A single register for the whole country similar to the one in amsterdam would benifet dublin emensly. Imagine buying a used car from someone who didn’t have a certificate of registration, well hopefuly this will be our attitude towards used bikes in the future. If you would like to Regester your bicycle with us you’ll need to bring photo id and a letter from your house, we dont charge for this service but we do ask for a donation for the registry witch we will use to expand the registry.